Fleurette here :) I've had so much fun Guest Designing for Trendy Twine this month!!! Since Christmas is coming soon and this is my last post this month, I wanted to go out with a Bang! So, I created these Christmas Drum Gift Boxes. 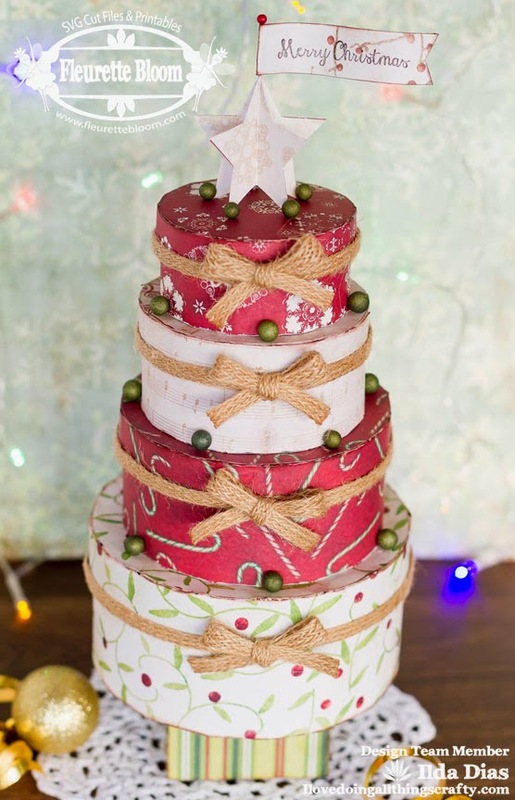 The Krafty Red Trendy Twine gives it that extra special touch! 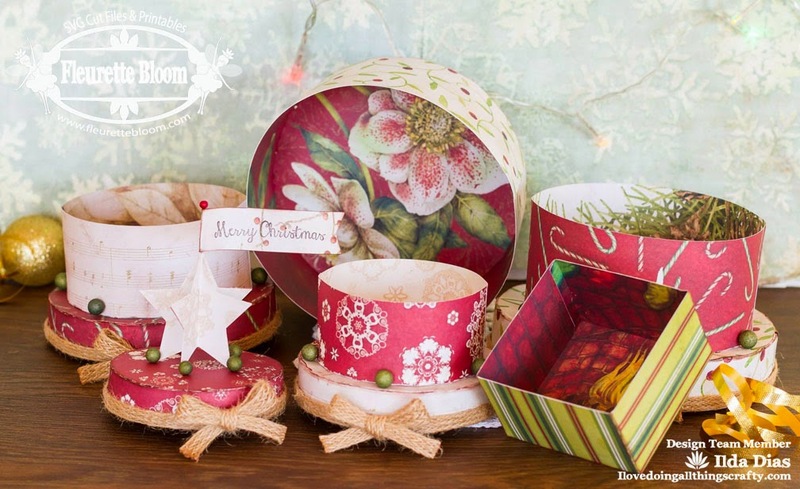 Fill each drum full of goodies or special gifts, it's also an adorable addition to any Christmas decor. Ribbon 3/8"W - to go around top edge of lid. (double stick tape works great for quick application, or you can use little dots of hot glue). 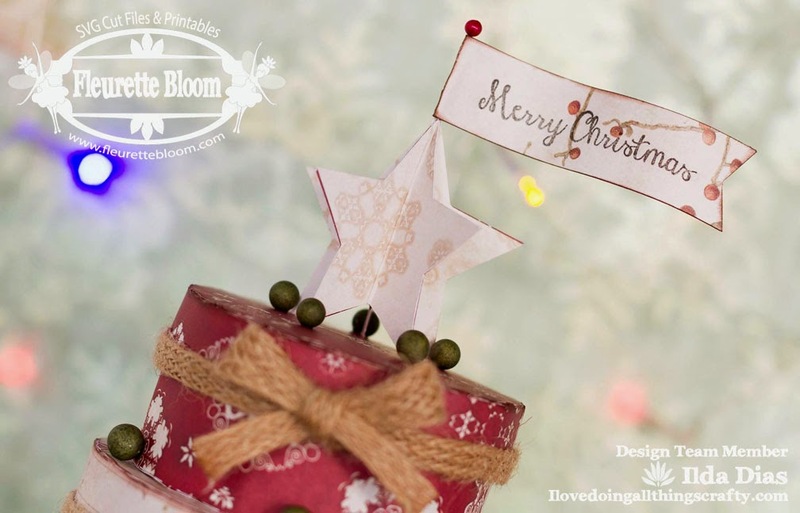 Tip: Use hot glue to adhere the twine to the box edges, just a tiny dot here and there is all you need. 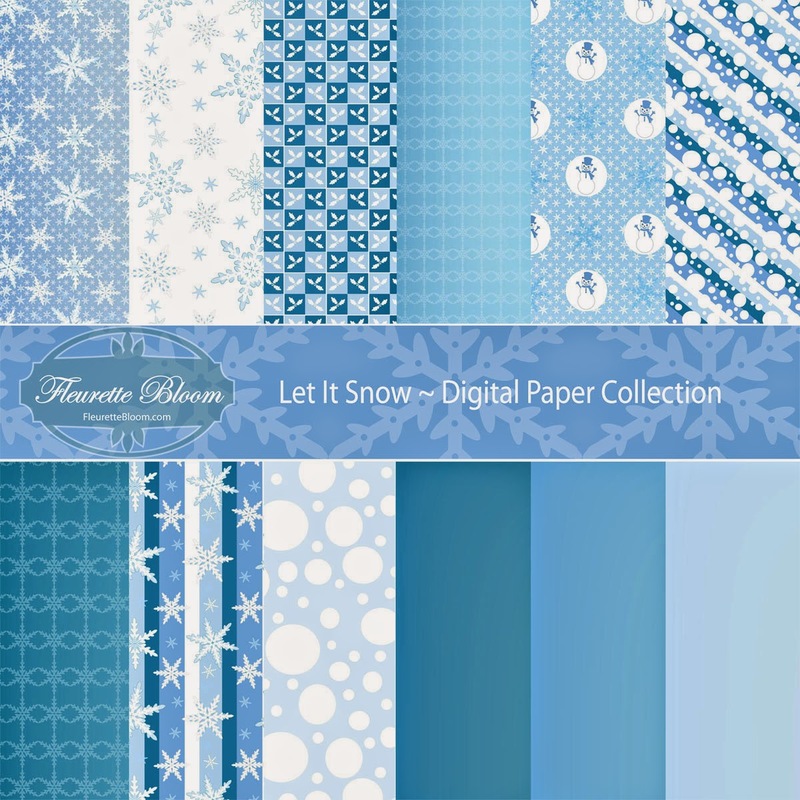 The paper pack I used for this is "Let It Snow"
Check out all the layers I have to fill up with goodies! 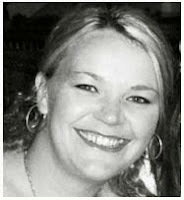 Hi everyone, Chantel here today to share with you my latest DT project. 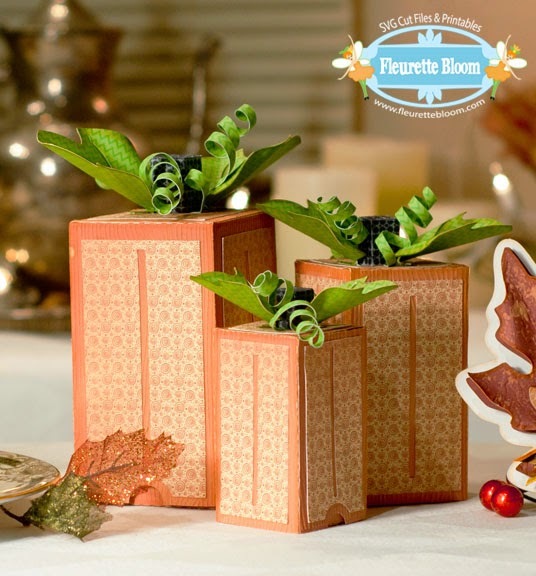 Although we don't celebrate Thanksgiving here in Australia, I simply couldn't resist making Fleurette's cute little pumpkin boxes from the Harvest Happenings 3D SVG kit! I just love the colours of fall (again not something we see much of here in the Sunshine State), so I was thrilled to use some lovely fall papers for a change. For the tag, I resized the leaf place setting files from the same kit and sprayed them with some Perfect Pearls mixed with water for a touch of shimmer. Whilst the leaves were still wet, I crinkled and curved them a bit and then dried them with a heat gun. I think it gives them a more natural look, don't you? I did the same for the leaves on top of the boxes and then ran the vines through a crinkle machine before I curled them. As a final touch, I added some natural twine around the stems and grouped the boxes together with ribbon and some more twine. ﻿I'm really pleased with how my trio turned out and so happy that I decided to do this project even though we don't celebrate Thanksgiving. 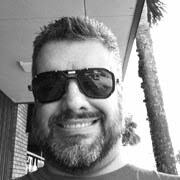 I hope that I've inspired you to make some too! 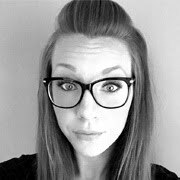 I am having so much fun being a Guest Designer for Trendy Twine! I really wanted a pretty fall wreath for my front door and thought why not make one out of paper! 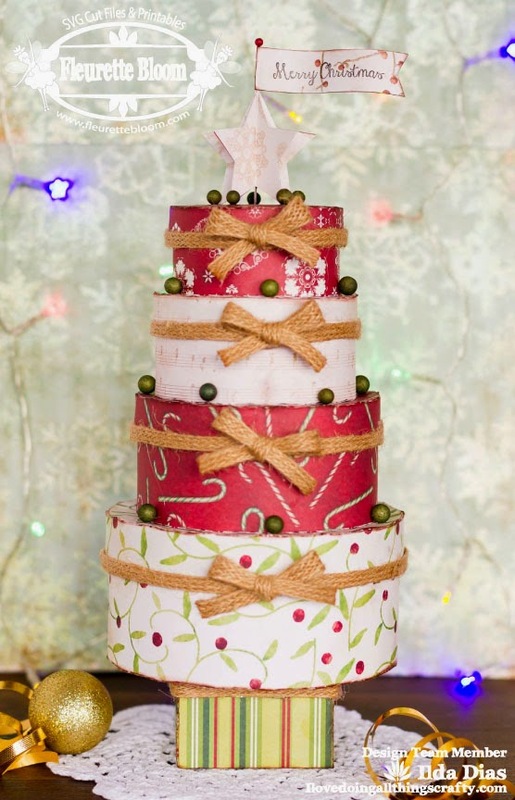 To embellish it I chose a few beautiful colors of Trendy Twine, picking up on the colors in the papers. I also threaded twine through the buttons around the edge of the wreath, adding lots of texture and dimension. Don't have a cutting machine? No worries! 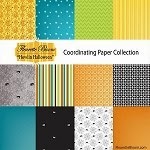 Try our New Hand Cut Project File! 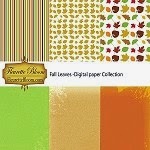 Fall Leaf Wreath Hand Cut Project File ~ Print out the images on your home printer, cut and glue! 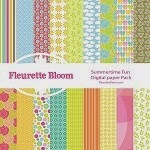 The coordinating paper pack I used to create this project is "Summertime Fun". Cut twine in 39" strips wrap twine around 4 fingers leaving tail at each end. 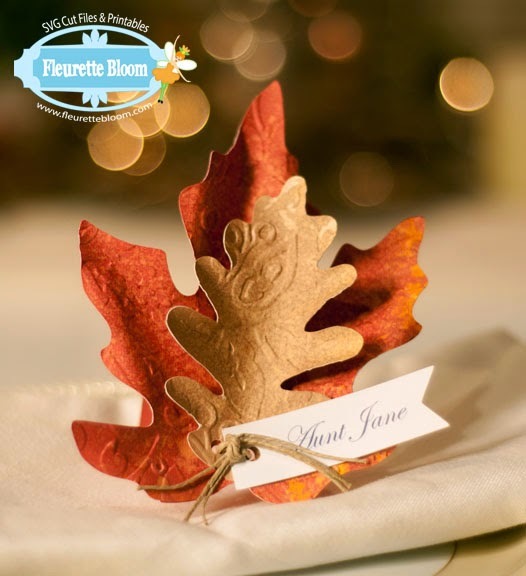 If you create one, please share it with us on the Fleurette Bloom Facebook Page! 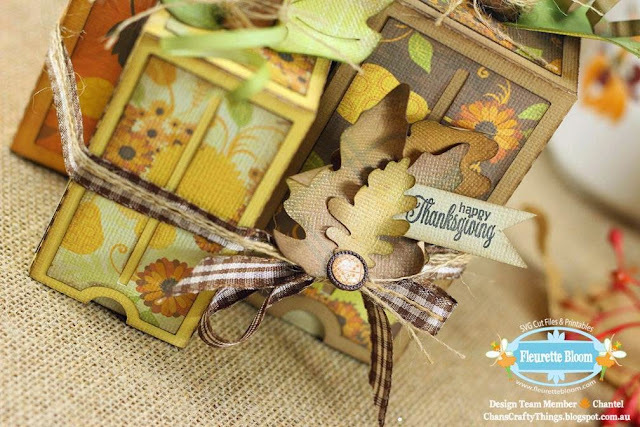 The new "Harvest Happenings" 3D SVG Kit, A fun fall themed kit, giving you everything you need to create beautiful memories, party decor, place cards, invitations, gift boxes and party favors. The "Pumpkin Trio" is a series of 3 different boxes, I used a wood grain embossing folder to give them a crafted wood charm. 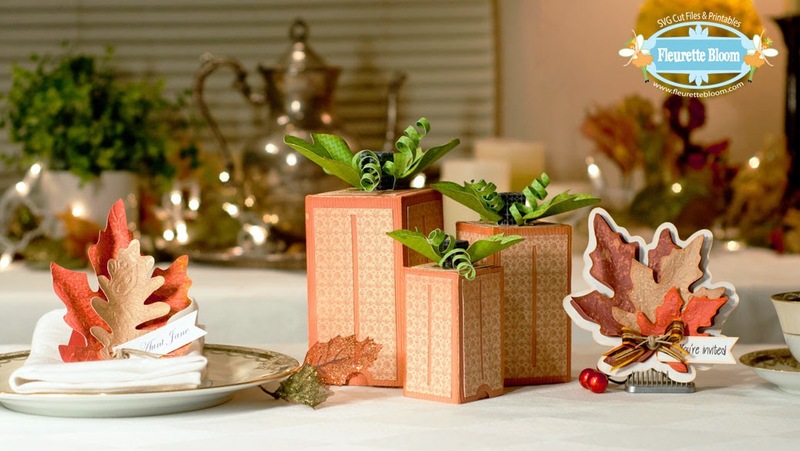 Use them as gift boxes or a centerpiece. 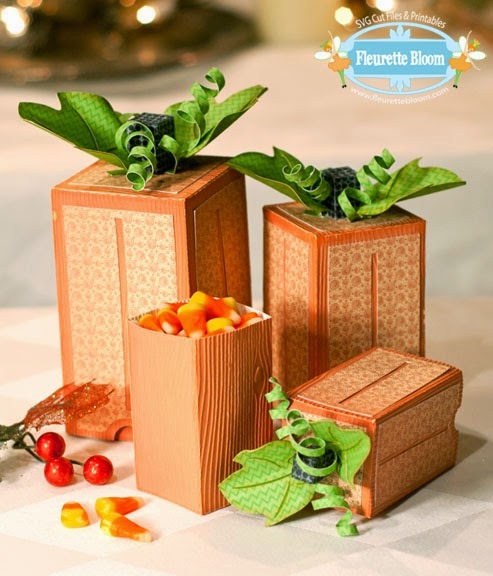 These would also be great gift boxes for birthdays or other occasions, just add a bow or flower to the top instead of the leaves. 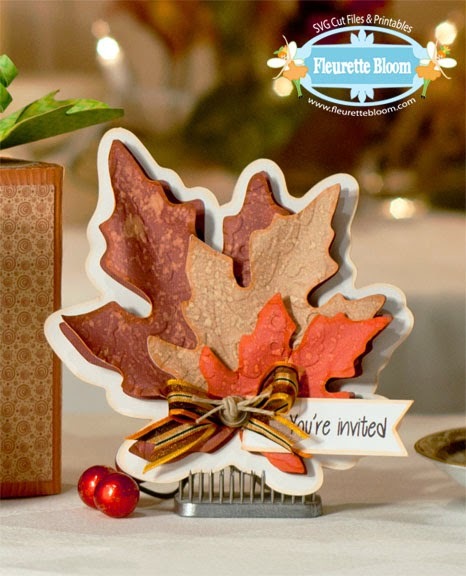 The "Leaf Place Setting" is elegant, charming and gives just the right touch to your table. Your guest will enjoy the feeling of bringing the outdoors in. 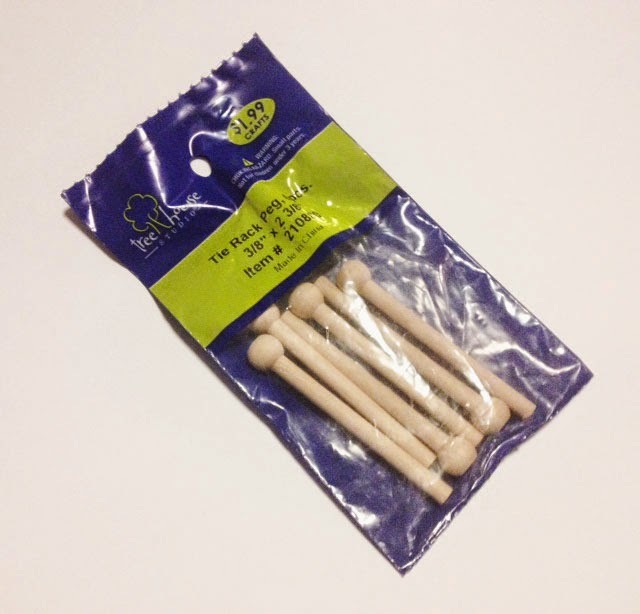 Use them with the easel or without if you would like to lay them flat. 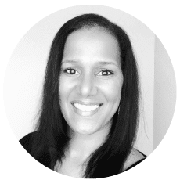 When I was asked to Guest Design for Trendy Twine I was so honored, as it is my absolute favorite go to for that extra special finishing touch on projects. Also the quality of the product and people are top notch!!! 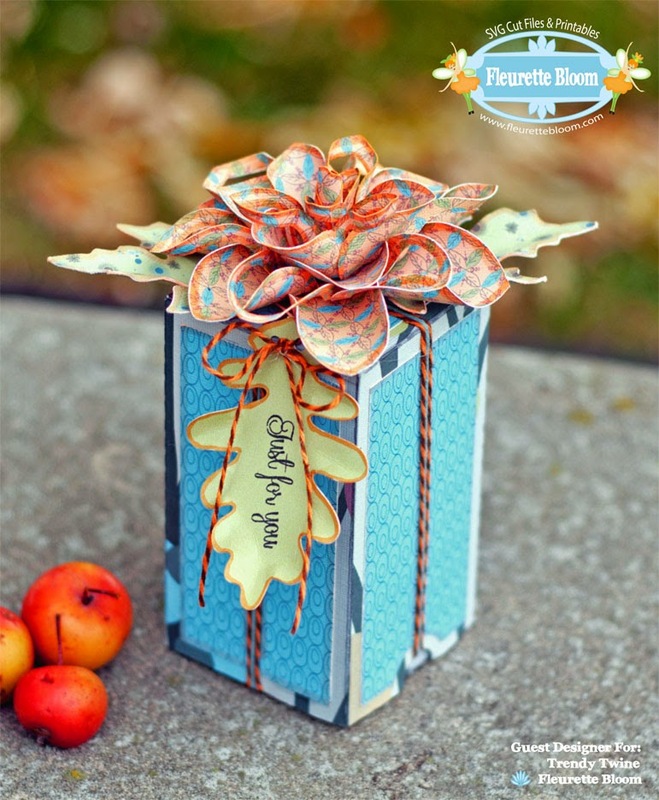 Today I am sharing with you a pretty fall themed gift box that I embellished with Orange Truffle and Totally Sky Trendy Twine giving the appearance that it is all wrapped up. 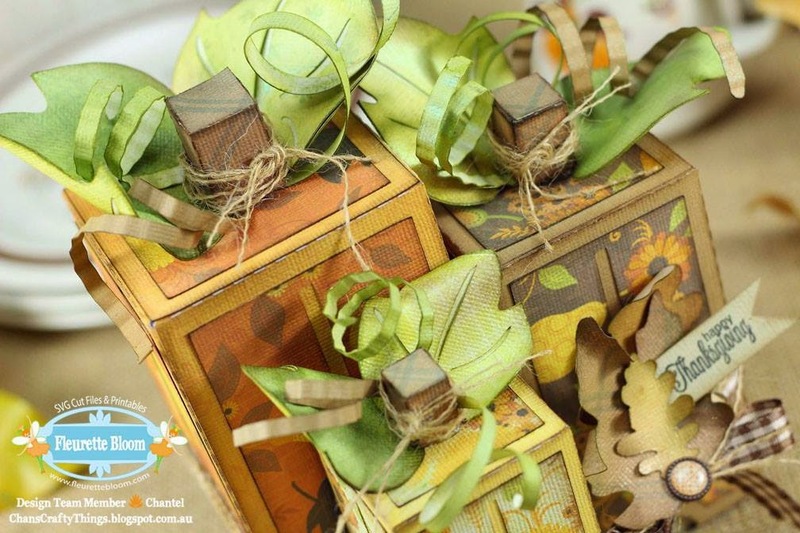 The fun part is you can open it without removing the twine! It will always look like a pretty wrapped up package / decoration. I think this will make an extra special gift! "Harvest Happenings" - Pumpkin Trio Med. sized box and leaves from the Place Card. 1. Cut strands of twine long enough to reach around two sides and top of box. 2. Drape strands over top and sides of box forming and X. 3. Glue twine strands with hot glue to the top / center of the box (let strands drape down the sides. 4. Glue bottom ends of twine to bottom edge of box, then cut so they are even with the bottom of the box. 5. 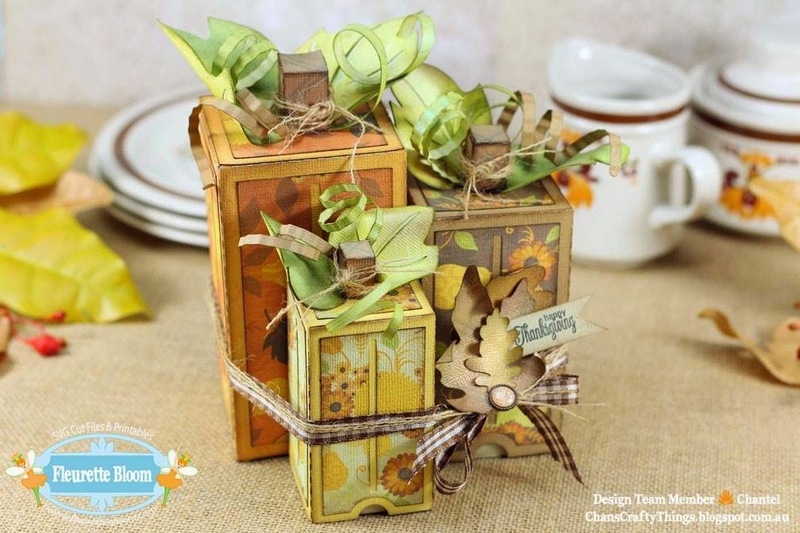 Glue on your leaves and flower to top of box. Thanks for popping in to see my project!